Hang leaves from the chandelier using string and a needle. 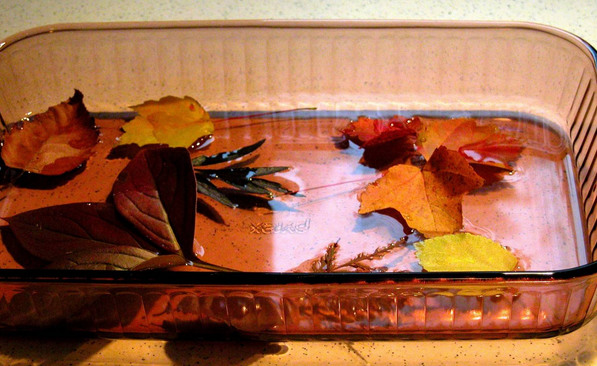 The leaves can be preserved with a special solution. When the leaves are preserved in glycerin, the leaves will last longer and resist breakage into your guests’ food. These leaves can also be scattered on a table around the centerpiece also. Many dinner party hosts use candles as centerpieces and scatter the leaves around the vases. Leaves are a festive way to stay in the holiday mood. Consider how leaves can make your holiday party festive and wonderful. For this arrangement, buy a fall bouquet of flowers. 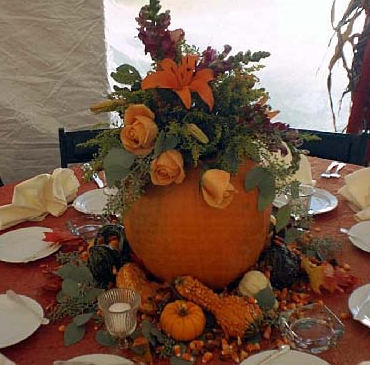 This floral arrangement can consist of roses, pumpkins, squash, peppers, and chrysanthemums and callas lilies in colors such as red, yellow and oranges. These floral arrangements can be placed on the table and around the home to make the home more inviting. Holiday centerpieces make the home festive and bright. Everyone loves tasteful decorations. Consider making one of these easy creations to welcome your guests and help make your event festive. Most guests enjoy a well decorated home for the holidays. Luckily, these decorations are easy to make and are affordable in most instances. When you use natural elements such as nuts, leaf cuttings, leafs, mistletoe and other natural holiday leaves, you save considerable money. Consider DIY holiday centerpieces to enhance your holiday party.